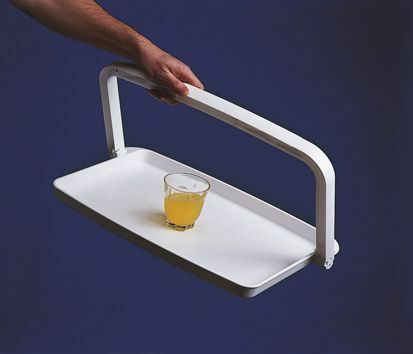 One-Handed Tray With Folding Handle, Easy Clean. With a folding handle that folds away when the tray is set down, this item is made from long lasting, easy to clean plastic. What’s more, it has a textured surface that will help items from sliding about when in use, and raised edges that stop spillage from leaving the tray. Thank you for the prompt service in sending the one handled tray to me. Tracey was very helpful and as I have now to use a walking stick to get about the house, the tray will be very useful. I will not have to make several trips to take items from one room to another.